On a fashion website, “Jacks and Jokers”, the creators celebrate an American icon, the deck of cards. Playing cards have been in America over 100 years and provided us with much entertainment. 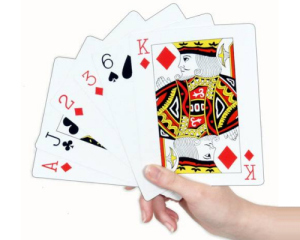 Most of us would have to admit that we played countless games of War and Gold Fish as children, solitaire as teens, hearts as college students, and perhaps Bridge or Gin Rummy in our adult life, all with a deck of cards. Teachers use them as a sorting activity for pre-schoolers, casino dealers use them to entice us to put our money on the table, and magicians use them to wow us with their ability to guess the card we thinking of.